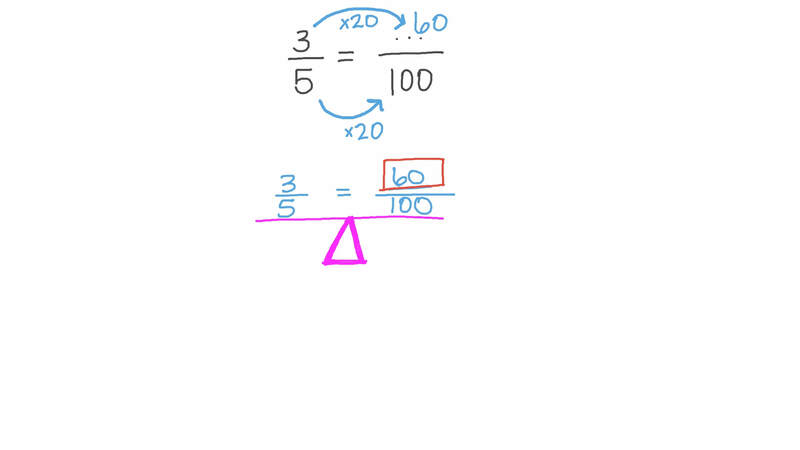 In this lesson, we will learn how to get an unknown value in a proportional relation using cross multiplication and how to apply that in real-life situations. Given that 8 1 9 = 4 𝑦 , which of the following expressions must be equal to 8 × 𝑦 ? 3 5 = ⋯ 1 0 0 . If 6 6 𝑥 = 0 . 7 5 , find the value of 𝑥 . If 8 and 3 are in the same ratio as 96 and 𝑥 , then find the value of 𝑥 . The numbers 6 and 19 are in the same proportion as 𝑥 and 22. Calculate the value of 𝑥 , giving your answer as a top heavy fraction in its simplest form. 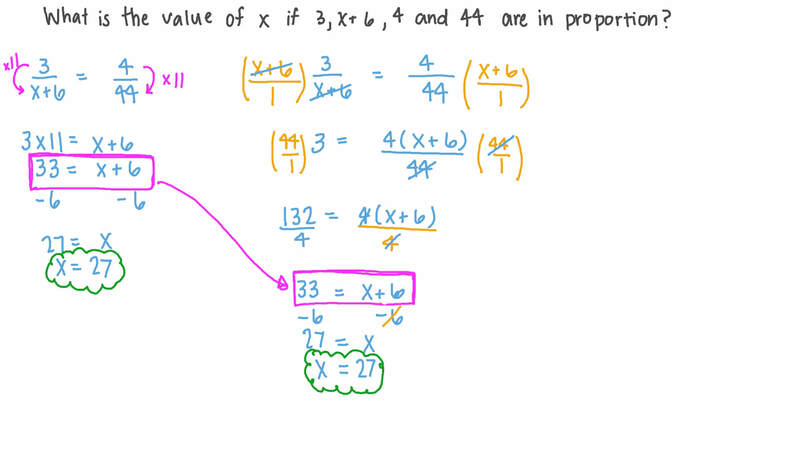 What is the value of 𝑥 if 3, 𝑥 + 6 , 4, and 44 are in proportion? Which of the following shows a proportional relationship? If 7 𝑥 = 4 2 7 8 , find the value of 𝑥 . If 5 3 = 𝑥 2 . 1 6 , find the value of 𝑥 .
Ramy ran 7 km in 45 minutes. How long would it take him to run 14 km at the same speed? It took Amir 30 minutes to bike 7 miles. At this rate, use a ratio table to find how long it would take him to bike for 21 miles. A person walks 10 kilometres in 40 minutes walking at a constant speed. If they continue walking at this speed, how long will it take them to walk 6 kilometres? 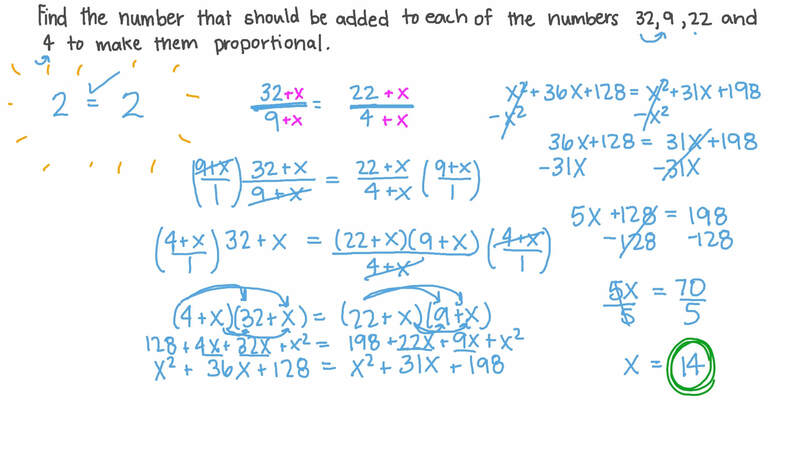 Find the number that should be added to each of the numbers 32, 9, 22, and 4 to make them proportional. If 𝑎 𝑏 = 𝑐 𝑑 , then 𝑎 × 𝑑 = . Given that 𝑐 4 = 2 4 3 2 , find the value of 𝑐 . Given that , find the value of .